While I'm ecstatic that Firestar is FINALLY on the team, the previews looked just ok. I'm still curious enough to read it, though. Dude, I am loving it. Firestar is a welcome addition to the team but front and centre stage for me is the return of Nightcrawler. Should shake things up a bit. I love that the return seems to pay small homage to the original Nightcrawler mini-series, but also the reaction by all when he returns to everything that has happened in his absence. Will it also have an impact on some of the recent decisions made by some of his closer friends. Or will those decisions impact upon him? All makes for a lot of story potential across the X-line of books if handled well. Amazing X-Men definitely has potential. I am so glad that Nightcrawler is playing a role in this, and we're finding out more about his dad and those Bamfs. Firestar is also a welcome addition, I can't believe how long they've had her playing in the lower ranks. Wasn't she on that Young Allies a couple years ago? She definitely should've been playing in the big leagues far sooner than now. I see both happening, but I'm really eager to see how being in Heaven is going to change how he lives this time around. He made it to paradise and wanted to leave. How will THAT impact his decisions? Nightcrawler for me. I came back to X-men book in 2011 and it wasn't the same without Nightcrawler. 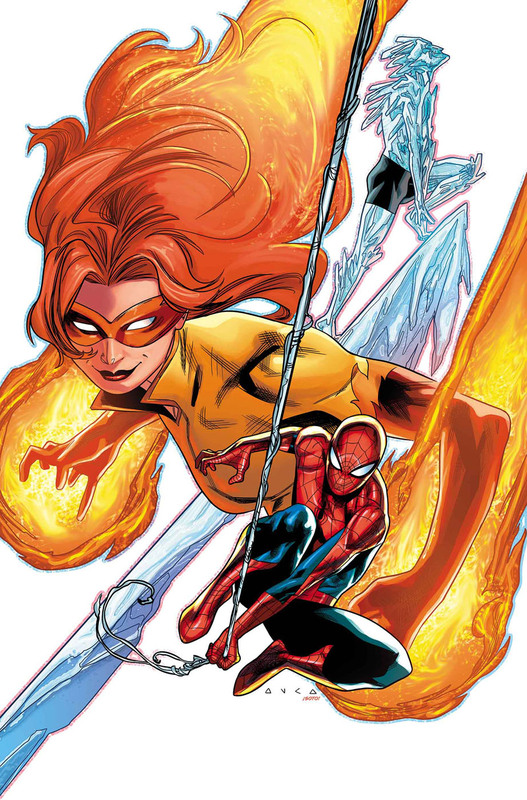 I like the dialog between Firestar and Iceman for all the "Amazing Friends" nostalgia... so it's about time they were on a team together. Nightcrawler gets his own title in April after this story wraps. I'm glad he's back, but unfortunately (even for as big a fan I am of the character) his solo titles have never been all that great. Some have been fun. Others a little dull. I hope this one is better. Did I say "AMAZING FRIENDS"???!!! My fondest childhood memories are all flooding my head right now! Can't wait for this! !